Are you a McMaster employee with a disability? Do you personally identify with disability-related issues? Do you want to share information or offer suggestions for enhancing accessibility at McMaster? 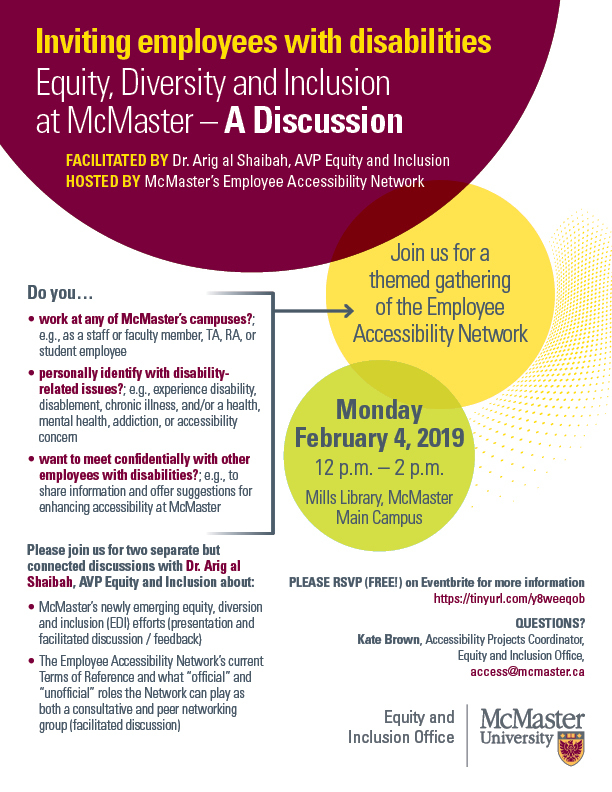 If so, join McMaster’s Employee Accessibility Network on Monday February 4, 2019 for two separate but connected discussions with Dr. Arig al Shaibah, Associate Vice-President, Equity and Inclusion. During the first part of this special Network meeting, Dr. al Shaibah will present and provide opportunity for feedback and discussion on McMaster’s newly emerging equity, diversity and inclusion (EDI) efforts. This will be followed by a facilitated discussion about the Employee Accessibility Network’s current Terms of Reference and what “official” and “unofficial” roles the Network can play as a consultative and peer networking group for McMaster employees with disabilities. When: Monday, February 2, 2019 from 12:00 p.m. – 2:00 p.m.